HE is famed for exploring the dark underbelly of Scotland’s capital in his best-selling Inspector Rebus novels. But Ian Rankin’s fans, who are used to his favourite rock bands popping in his novels, may be surprised at his latest artistic venture - supporting tapestry making. Rankin and his wife Miranda Harvey, an amateur weaver herself, have launched a new international tapestry contest with their own money in a bid to raise awareness of the art form and more than 100 years of tapestry weaving in Edinburgh. They have launched an exhibition of work by 10 leading artists from around the world, which is on display at the Royal Scottish Academy in Edinburgh for the next few weeks. The £5,000 cash prize, which will run for at least three years initially, went to a Norwegian artist, Ann Naustdal, while other work on display was created by artists from Australia, Belgium, the Czech Republic, England and Scotland. The Cordis Prize for Tapestry has been launched at a time of renewed interest in tapestry-making thanks to hugely-popular projects like The Great Tapestry of Scotland, which author Alexander McCall Smith instigated and helped pay for. Mr Rankin said: “I’ve had interest in art for a long time, but I have to admit tapestry weaving wasn’t really up there until Miranda got interested and started doing it. “I’ve got to meet people who are weavers but I’ve also got a sense of how important it has been in Scotland, and especially in Edinburgh, with places like the Dovecot Centre, where I went along to see Alison Watt unveil her huge tapestry for the Theatre Royal in Glasgow. “When Miranda comes on tour with me around the world there are always tapestries she wants to see in public collections. She would want to talk to the weavers and it was almost as though everywhere we went people were so complimentary about what happens in Edinburgh, but no-one here seems to know much about it, it is almost invisible. “It’s an international art form that, as with many things, Scotland punches above its weight in, but in a way that is only recognised outside Scotland. 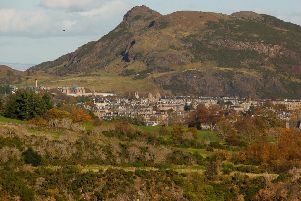 Ms Harvey said: “Edinburgh is actually an amazing place for this particular art form, it really is a world centre for it. It goes under the radar a bit because tapestry weaving has a bit of a reputation as being a bit elitist. “But you can buy work from a lot of really lovely independent weavers in Edinburgh. Their work is so rewarding and beautiful. We just wanted to show them that someone is interested in what they’re doing. “I practice tapestry weaving myself, but I am just a dabbler in it, really. I’m not up there at all with any of these international artists. The 10 shortlisted Cordis Prize for Tapestry works will be on display at the RSA until 28 February.